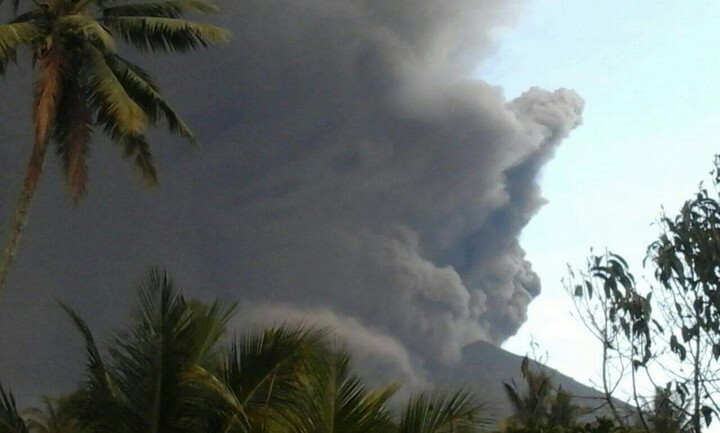 The volcano in Bali erupted then residents nearby should evacuate. The volcano Mount Agung erupted November 2017. The upgrading of the gravity status at Mount Agung to date has reached its highest level, Level IV. The Center for Volcanology and Geological Hazard Mitigation has mapped the dangerous area within a radius of 8-10 Kilometers since 27 November 2017, leaving residents living in and around the mountain to evacuate. According to data from the Operations Control Center, Bali Disaster Management Agency (Pusdalops BPBD), the number of refugees on 29 November 2017 was 43,358 people, spread over 229 refugee camps in Bali. Residents living around the danger zone must evacuate to avoid the impact of Mount Agung eruption. The threat of volcanic eruptions in Bali is the dangers of hot clouds, lava flows, rain stones, incandescent rocks, and more ash rain. In addition to avoid the other negative impact caused by the eruption of Mount Agung. The point of evacuation of Mount Agung eruption is in Buleleng Regency of 5,992 people, Klungkung 7,790 people, Karangasem 22,738 people, Bangli 864 people, Tabanan 657 people, Denpasar City 1,488 people, Gianyar 2,968 people, Badung 549 people, and Jembrana 312 people. The governor of Bali urged the residents to evacuate around Karangasem, the district where the volcano erupted in Bali. This is done to facilitate handling. Regent of Karangasem, has determined the emergency response situation in Karangasem regency for 14 days starting from 27 November 2017 to 10 December 2017. The validity period of this emergency response statement can be extended or shortened according to the need of emergency handling. With the gathering of refugees at one point, the National Disaster Management Agency will have easy access in the field of human resources mobilization, equipment deployment, logistics deployment, immigration, excise and quarantine, licensing, procurement of goods or services, management and accountability of money and or goods , rescue, and command to order agencies or institutions.